In order to avail this offer, You should book the tickets within the below conditions. - Prices are only for One way and direct flights. - Domestic flights covering cities, Riyadh, Jeddah, Dammam, Madinah, Abha, Hail, Jizan, Bisha, Qassim, Al Jouf and Al Baha. 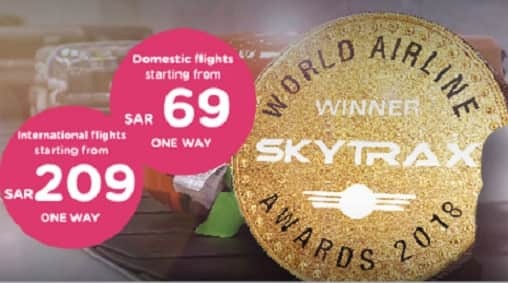 - International flights from Saudi Arabia to Kuwait, Dubai, Amman, Cairo, Beirut, Khartoum, Lahore, Islamabad, Sharm el Sheikh, Antakya, Adana, Istanbul and Hyderabad.